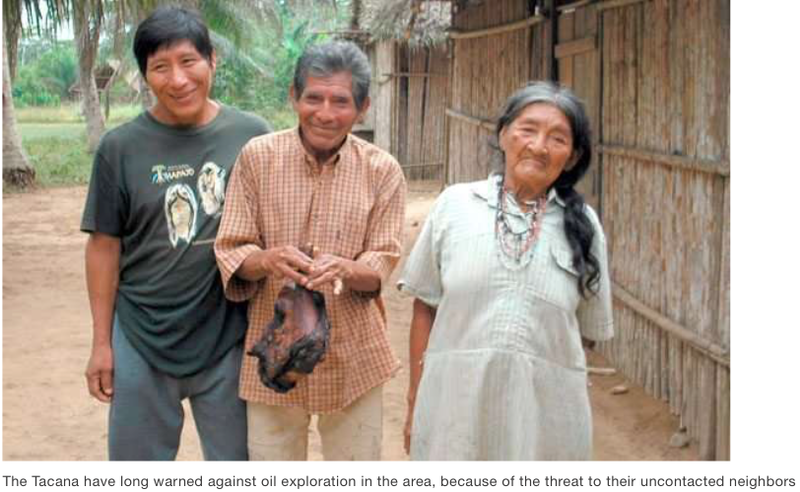 The Bolivian state oil company has denied reports that workers prospecting near the Peruvian border have had several encounters with a group of uncontacted Indians. The company, YPFB, had sub-contracted the exploration work to BGP Bolivia, a subsidiary of a Chinese oil corporation. On the night of the 18th, workers were surrounded in their camp by Indians, presumably from the same group. If it continues, it could be catastrophic for the uncontacted tribe, sometimes referred to as the Toromonas. The plans for the two oil exploration blocks in the area involve hundreds of tracks to be cut through the forest, and more than 61,000 small underground explosions. The noise and disruption, and the influx of workers deep in the jungle, brings a serious risk of unplanned or forced contact. Uncontacted tribes are the most vulnerable peoples on the planet, and this will increase the risk of the Indians contacting diseases like flu and measles to which they have no resistance. The work takes place in the Amazon Uncontacted Frontier, home to the highest concentration of uncontacted peoples in the world. They face catastrophe unless their land is protected. 17th October: The President of YPFB denies the existence of uncontacted people. This entry was posted in Bolivia, Business, Economics, Energy, Environment, Politics, Social Unrest and tagged environmental awareness, freedom of choice, indigenous rights. Bookmark the permalink.